The choice of using glasses or contact lenses to correct vision is often one of personal preference. Convenience, cost, and appearance are all factors to consider. For patients who prefer contacts, our Eye Site optometrists in Katy and Houston offer a variety of lens types, including gas permeable contact lenses. Other names for these lenses are RGP contact lenses, GP lenses, rigid gas permeable lenses, and oxygen permeable lenses. What Are Gas Permeable Contacts? 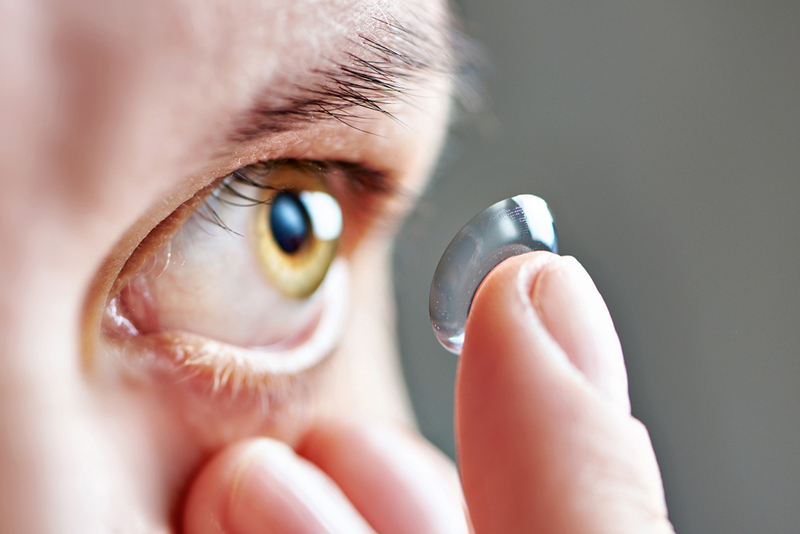 Current contact lenses vary greatly from old-fashioned hard contacts, now considered obsolete. The material in hard lenses was polymethyl methacrylate (PMMA), a plastic also referred to as acrylic. Until the industry introduced soft contacts in 1971, nearly all contact lenses were manufactured from PMMA. One of the drawbacks to hard contacts was their inability to allow oxygen to permeate to the cornea. The only way for it to get through was tear production, which required a small contact lens and a gap between the lens edge and the cornea’s surface. The resulting design caused discomfort for some individuals and a tendency for lenses to pop out of the eyes during intense activity. Soft contacts became available in 1971. RGP contact lenses followed at the end of that decade. Most of these rigid, gas permeable lenses contain silicone, which has more flexibility than PMMA does. Silicone allows oxygen to pass directly through a lens to the cornea without relying on tears. RGP contact lenses actually permit more oxygen to pass to the cornea than most soft contacts do. Their design means more comfort and easier adjustment than that associated with hard lenses. They also offer improved durability, vision, and resistance to deposits compared to that found in soft contacts. Sharper vision: When a patient blinks, the plastic material in gas permeable contacts keeps the shape of a lens intact. This usually results in sharper vision than what soft lenses are able to provide. Durability: Unlike soft lenses, gas permeable contacts do not tear easily. Deposit resistance: RGP lenses contain no water, unlike soft contacts. It is, therefore, more difficult for proteins plus lipids from tears to adhere to them. Expense: So long as the prescription remains the same, gas permeable contacts cared for correctly could last for years. Common disadvantages include a required period of adaptation to reach maximum comfort and the need to wear gas permeable lenses regularly to maintain it. Since RGP lenses are smaller than soft contacts, they carry a greater chance of dislodging during physical activity. While their design allows gas permeable contacts to move with each blink, it creates an increased risk that dust or debris will lodge under them. The result could be discomfort or a corneal abrasion. A final consideration is a time and effort required for the care of gas permeable contacts. Our experienced optometrists use the latest technology to prescribe a variety of types of contacts for our patients. In addition to gas permeable contact lenses, we fit disposable and frequent replacement soft contacts, traditional soft lenses, astigmatic lenses, tinted soft contacts, bifocal contacts, hybrid lenses, and special contacts for presbyopia and astigmatism. We offer a variety of brands, including Proclear, Multifocal Duette™, CIBAVision, CooperVision, Biofinity®, Bausch+Lomb, Alcon®, Air Optix®, and Acuvue®. Our practice has been providing outstanding comprehensive optometric services and optical products for more than 25 years. The goal of our optometrists is achieving exceptional family eye care with complete patient satisfaction. We offer state-of-the-art technology and products to meet your vision needs and have two convenient locations. Call us today to make an appointment at the Eye Site of Katy at 281-644-2010 or at the Eye Site of Memorial in Houston at 713-984-9144.